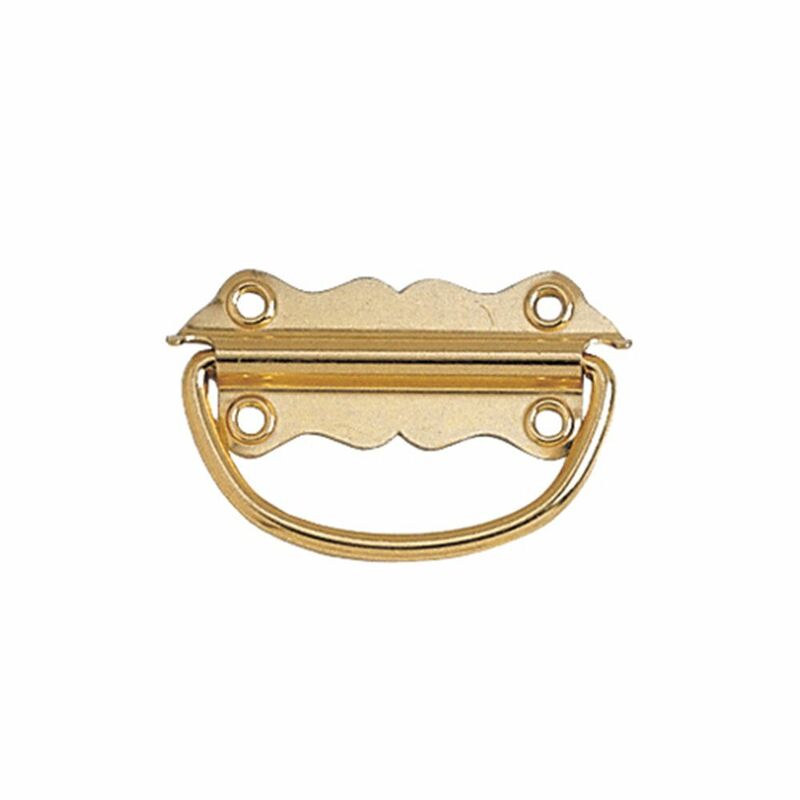 Medium gauge ornamental steel chest handle. Handle stops at 90 degrees to the backplate. This chest handle not only fits well, but the appearance makes the project looks rich. Good product easy to use! I got these got these for the low profile so I can put boxes near each other. These are very sturdy and take just minutes to install. I don't recommend these for something you carry for long periods of time or that are heavy (>30 lbs) as they would start digging into your hand...but for general lift and move short distances they are perfect. 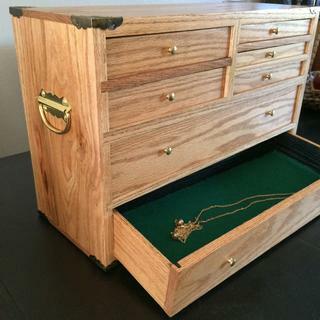 I have built several of these Jewelry boxes with the Rockler Chest Handle and Brass Knobs. I have never stripped out a screw either in Oak as seen in the photo or 100 year old reclaimed Chestnut. Pilot holes of the correct size are required. This handle would not be appropriate for a large blanket or hope chest, but used in the proper application is excellent. Excellent piece, good quality . Used them on a number big small Chest. They work great and make the chest look good. The Wixley angle gage is the best thing to slice bread. It lets you know your exact angle for those difficult cuts. Would recommend it to anyone. Purchased for a boys treasure box, it was a very good fit for the application. I use these handles a lot on cedar blanket chests that I build as Christmas gifts for family members. Like other reviewers have stated, the brass loop is a bit small for an adult's hand and should be increased in size slightly. 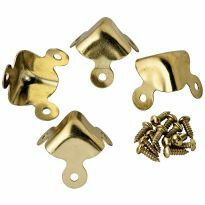 As for the screws being too small and tearing out, I always replace them with size 10 brass machines scews sized to the thickness of the wood. The machines screws hold great, even with a chest full of blankets and quilts. 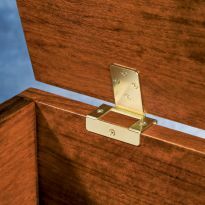 Overall, the handles are very nice and compliment full-size brass piano hinges and other brass hardware on the chests I build. Handle was shipped promptly and arrived in good condition, but unfortunately was much to light and flimsy to use on the hardwood hope chest I had built. 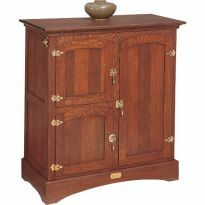 It looks good in the picture but the handle would be appropriate for a much lighter chest. The handles are adequate, but the screws twist off. Save yourself some aggravation and just throw the screws away and use different ones. I used the handles on a toy box for my grandson. I advised my son to NOT use them to move the box. They are not strong enough. I used two on each end, they look great but that is all. Used them on a cedar chest. Believe they will break if chest is moved when full.Used different screws because the ones that came with them seemed inadaquate. I ordered 2 (they do not come in pairs ???) One was bent. Poor quality, would not but again.. Doesn't seem to be a quality piece of hardware - seems more decorative then anything. The screw heads popped on me on 3 of the 8, since the pre-drill holes were not &quot;perfectly&quot; lined up (and I thought they were). If the screw touches the brass plate during tightening they will pop. Looked nice once on though - I don't trust the amount of weight it can hold yet though. Very small opening, I purchased to put on to the side of a toy box I had made for a relative. No way for an adult to get their hand in the handle opening, fingers only. Would be a good handle for kids use. Every other screw head broke off upon tightening - even with pre-drilled holes. I had to use different screws altogether. After I built the above cabinet and mounted it on casters, I needed another handle to pull it the other direction. Making a Corn Hole game set. 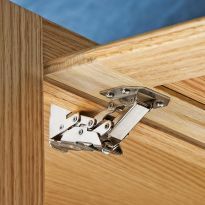 A separable hinge set, along with a catch and this chest handle will allow the two boards to be attached to each other for easy carrying and storage. I liked the looks of these handles on the last box I built and plan to use them again. I really wanted antique brass, I'm making a treasure chest. 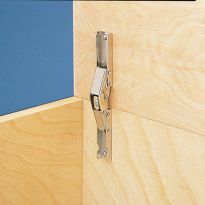 It has a 90 degree stop and is described as high quality and durable. 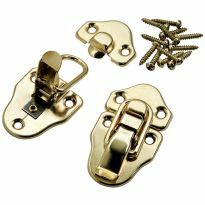 To match other brass hardware. Specified in the plans for tool box I was making. 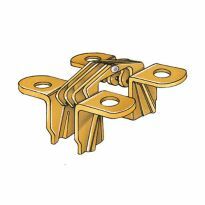 Dimensions of the attachment plate? How many handles come in a pack?